The narrative surrounding Celtic’s Europa League meeting with Ajax may have changed in the last 24 hours but Ronny Deila’s approach to it remains the same. Any manager losing the services of his influential captain on the eve of such a crucial fixture, adding to the absence through suspension of two other key players, would merit a degree of sympathy. So as Deila revealed the news that skipper Scott Brown faces up to 12 weeks on the sidelines with a knee injury, there was a sense it has actually lessened the pressure on the Norwegian coach ahead of tonight’s showdown with the Dutch league leaders. Already without banned duo Stefan Johansen and Nir Bitton, while Kris Commons is a major doubt, Deila can reasonably hope for a greater degree of slack being cut in his favour on this occasion should his team experience another European disappointment. But regardless of how he puts together what will now be a makeshift starting line-up, Deila does not suddenly regard it as a game where unfortunate circumstances have dictated Celtic have nothing to lose. 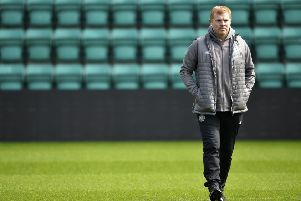 Achieving a place in the last 32 of the Europa League for the second successive season is still his primary focus in an unpredictable Group A which has contrived to keep Celtic’s fate in their own hands, despite taking just two points from their first four matches. Victory over Ajax at Celtic Park this evening, followed by another win against Fenerbahce in Istanbul on 10 December, would take the Scottish champions through. There is even a scenario where a draw tonight could be enough, should group leaders Molde defeat Fenerbahce in Norway, but it isn’t one Deila is seriously contemplating. “We would go for it anyway against Ajax,” he said. “It’s in our hands. We need to win. Maybe a draw would do, but I don’t think that. “We have to go for three points and have 90 minutes to do that. We will look to do a lot of the things we did against Fenerbahce at home, while avoiding the easy mistakes we made which meant we only drew that night. We have good players, despite the injuries and suspensions, so I have a belief we can do it. “There is nothing to fear and we will go into this game with no fear. The worst thing that can happen is that you can lose. You don’t lose your life, things will go on. With the significant personnel changes he will have to make, Deila may also have to consider a move away from his preferred 4-2-3-1 formation. But although he confirmed that is a possibility, he also feels he has the players to fill the gaps and retain his first choice system. Stuart Armstrong, Tom Rogic and Efe Ambrose are among those who could switch to the holding midfield positions, while Scott Allan, Callum McGregor, Nadir Ciftci and Anthony Stokes are contenders for more advanced roles. “We have actually changed the system a lot of times,” said Deila. “We have played 4-3-3, we have played 4-2-3-1, we have played 4-4-2. We need to play with midfielders. There will have to be players who go into roles that they are not so very used to playing in. But we have players like Scott, Stuart and Callum who can play centrally in the pitch. We are going to fill the gaps. “It is going to be a young team on Thursday night, there’s no doubt about that. But it is a young team Ajax have as well. So it is a quite similar situation for the two teams. “Scott Brown has a lot of experience and is important for the team. But a lot of the other players are now starting to get a good rate of important games. This gives people the possibility to step up and become that leader we are talking about. “I talk to the players all the time and I can name the players who need to do that. Dedryck Boyata is one. He is a young 25, because he has not played so many games. He is getting experience now and needs to step up. “There are three steps with leadership. One, there is experience. When you go on the pitch and you don’t understand what is happening until the coach tells you afterwards and you look at the pictures. Then you say ‘okay, we should have done this or this’. “The second one is when you see something happening on the pitch but you can’t do anything with it. The third is when you become a leader, when you see things happening on the pitch and you change it yourself. “We need to get more players who are in that situation, where they can do something with it. Because as a coach, in front of 40,000 people, you can’t stand and yell at people and tell them what to do all the time. “You need people to take responsibility out there. So leading by performance is important, but so is taking command. “If we are going to do something in Europe now and in the future, we need players who adapt to that level and can be leaders on the pitch. These players need to step up and be men when you get into situations like we did against Malmo and Molde. “You are put into an important game and have to cope with it. When you get more calm and secure, you start looking at what is happening around you as well and can start controlling things. Ajax come into tonight’s match in free-scoring form, having defeated Cambuur 5-1 on Saturday to move three points clear at the top of the Dutch League. Perhaps ominously for Celtic, four of their goals came from set pieces. “We are prepared for that,” insisted Deila. “It was the same when we drew 2-2 with them in Amsterdam, but we also scored the same way there.